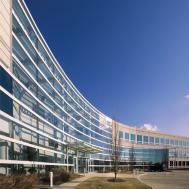 Bannockburn Corporate Center is a three-story Class A office building at 3000 Lakeside Drive in Bannockburn, in the Northbrook/Tri-State submarket of north suburban Lake County. Built in 1999, the building offers 209,255 rentable square feet and is situated in a campus-like setting, with trees and a scenic pond along the entry way. Within 20 minutes of Chicago's O'Hare International Airport and 35 minutes from downtown Chicago, Bannockburn Corporate Center offers immediate access to Half Day Road and I-94. The building is within close proximity to area hotels, restaurants and health clubs.